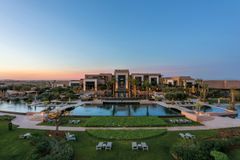 Inspired by Berber culture and located within an enormous 230 hectare estate which lies at the foot of the Atlas Mountains, Fairmont Royal Palm Marrakech is the standout resort in Western Morocco, taking luxury and service to new heights. With that in mind, as well as its own 18 hole golf course and an enviable location close to plenty of other top class courses such as Samanah Country Club and Al Maaden Golf; this superb resort is the ideal choice for anyone looking to sample the best of the best in and around the exciting city of Marrakech. Designed by Cabell B Robinson, the man responsible for many of Continental Europe’s best layouts, Fairmont Golf & Country Club offers preferred access to resort guests and is one of Morocco’s top ranked courses. Extending to over 7,200 yards from the back tees, Fairmont Golf & Country Club can certainly offer a stiff test even to the best golfers, and with Bermuda fairways and tees, as well as A4 bent grass greens, the course stands out from the pack in terms of conditioning, making a round on Fairmont Golf & Country Club most enjoyable. While more than three quarters of a million square metres of earth was moved during construction, the course appears very natural to the naked eye, blending seamlessly into the landscape which is awash with colour. A huge variety of shrubs, flowers and trees bloom at different times of the year all over the course, and with holes routed around 5 large lakes, it is one of the country’s most picturesque layouts. Wide fairways allow for some margin for error from the tee which allows a great range of golfers to enjoy the course. Stray too far from the fairway though and you’ll find your way into great swathes of sand in the form of waste bunkers. Speaking of bunkers, this is one of the most eye catching features of the course and with countless years of experience, Robinson has the traps well placed, forcing the golfer to carefully consider their shot selection throughout the course. While there are plenty of excellent holes at Fairmont Golf & Country Club, the short, and driveable for some par 4 3rd is a classic risk vs. reward hole. Doglegging right from tee to green, longer hitters will surely be tempted to take the aggressive line over the corner in an attempt to drive the green and bag a birdie while more modest hitters play for position in the fairway. With water the whole way down the right of the hole, and desert scrub to the left, neither option is an easy proposition and will require well struck shots in order to escape without losing shots to the course. Short game practice facilities include 2 putting greens and a dedicated chipping and pitching green featuring advanced equipment which can be used for technical analysis of your technique. The Golf Academy allows players to warm up before their round or even get a lesson and with a digital coaching studio featuring video analysis, launch monitors and swing analysis equipment, tuition is of the highest standard. Golf buggies and trolleys are both available for hire and come highly recommended with the weather conditions in mind. Temperatures can soar in Morocco so conserving energy during your time on the course is a must. Services include golf shoe care and with caddies on hand, you can always rely on some local knowledge to safely navigate your way around the course. A fully stocked proshop allows you to take to the course with everything you may require during your round. All accommodations feature luxury furnishings and amenities, and with large bedrooms, lounges and private terraces and balconies even in the entry level Junior Suites, a comfortable stay is assured. Rooms are supremely well equipped too, with telephone with international dialling, complimentary WiFi access, flat screen TV with satellite channels and in-room movies, mini-bar and luxury bathroom amenities all coming as standard. More luxurious options such as the Presidential Suite offer huge amounts of additional space, as well as further services and facilities including a valet service, 24 room service, and kitchenette should you feel the need to enjoy a home cooked meal during your stay. Luxury Family Suites are ideal for those travelling with youngsters and the Prince Villa offers the upmost in luxury, with its own private garden and swimming pool, not to mention a fully equipped kitchen and even a private hammam. Three superb restaurants service the Fairmont Royal Palm Marrakech and offer a superb array of flavours and cuisines, as well as different ambiences and al fresco dining too. Al Ain overlooks the golf course and allows guests the chance to sample the finest flavours Moroccan cuisine has to offer with a subtle and delicate blend of Arab, Berber and Moresque traditions present throughout the menu. Le Caravane offers a fascinating dining experience, whether you’re in the market for a fun evening with family and friends, a romantic evening for two, and anything in between. Choose from table d’hôte, the convivial room, private lounges hidden from view by Mashrabiya panels, or the Captain’s Table and enjoy international fusion cuisine. For lunch, be sure to head to L’Olivier. Overlooking the main pool, this charming eatery offers contemporary dining in a refreshing al fresco setting, where diners can choose from dishes including tuna tartar with olive oil, lime and ginger, filets of red mullet with pesto sauce, and beef Carpaccio with truffle oil. When the time comes for a well deserved drink, head to Le Bar, where each evening you can sip on your beverage of choice while relaxing to live jazz music. Should you feel the need to make use of your room, rest assured that the room service teams remain at the service of clients around the clock, with breakfast, lunch and dinner menus available in all the hotel suites and villas. Like other top class hotels around the world, Fairmont Royal Palm Marrakech has chosen Clarins, a leading brand in beauty and cosmetics, as a partner for its spa. Designed to resemble a Moroccan palace, Spa by Clarins offers the ultimate in relaxation and pampering. Choose from a vast array of luxurious treatments including the signature Supreme Rose Massage, or simply make use of the outstanding facilities that include a jet shower, hammams, sauna swimming pool, private garden and ice bath. Additional facilities at the resort include a semi-Olympic swimming pool, fitness centre, 4 tennis courts, table tennis tables, squash court and Pilates studio. All activities on offer at the sports centre are free of charge for resort guests, with additional fees being applied for private classes and equipment hire. One of the best hotels we have stayed in. Palatial bedroom with seating area,covered logia and sun beds beyond overlooking the garden, changing/ storage area and large bathroom with separate bath / shower. Excellent food with choice of Moroccan or international restaurants. Staff provided sandwich bags to enable us to take food out to eat on the golf course. All staff very friendly and helpful. Shuttle bus every two hours to Marrakesh centre booked the day before and taking about half an hour. We felt very safe. Very attentive staff and great facilities. Superb in every sense! The best fairways on our six course itinerary. A fantastic course to end our six course tour on, with clubhouse facilities to match! Five start plus! We enjoyed this course best of the three. The facilities were superb. We played four rounds, two were fast, one was going slowly when the starter arrived and took us around a slow group and one was very slow. Fairways were wide with light rough. Greens were very fast, well watered and proved difficult. Several par threes required accuracy due to lakes and bunkers. Weather high teens to low 20s and sunny at mid day but very cold early in the morning. Amazing views along fairways with precision sculpted bunkers. Fast greens but manageable with the gentle touch. Stunning views and club house. One of the best holiday courses you will find anywhere. great design and perfectly manicured. Best course of all. Practice area with free balls. Superb views of Atlas Mountains. Good time of year to play.Modern clubhouse and helpful staff/caddymaster. Buggy essential. Very enjoyable course probably our favourite of all 5 courses played during our holiday.